My different research interests span a wide range of topics within Oceanography, including global change, decadal-to millennial-scale variability in the ocean and climate, paleoceanography, geobiology, sedimentary processes, geochemical tracers, marine fisheries, and plankton ecology. My overarching interest is to understand natural variability in ocean climate and marine ecosystems to be able to determine anthropogenic effects on ocean systems. Such work is done by linking knowledge of ocean processes observed in modern records with historical observations and geological archives, and thus spans both ecological and geological timescales and processes. The geological archives I am involved with are mostly fossils from marine sedimentary records and coral cores. With students and other collaborators, we also work with historical data of ocean temperature, precipitation, fish catches, turbidity, and more. One of the more recent projects underway involves using cores from large Porites coral heads that span nearly 100 years of growth. Taking cores from these corals allows us to reconstruct environmental changes in the nearshore environment around Oahu throughout the 20th century. Through a collaboration with NIST, we largely look at changes in trace elements that sometimes replace Ca in the CaCO3 matrix that makes up the corals skeleton to determine changes in sediment input to the ocean, contamination, temperature, and other aspects of the coastal environment. Much of my investigations of past climate changes have been done with sediment cores from laminated sediments. Sediments accumulating in extremely low oxygen environments, such as in the Santa Barbara Basin or off of Peru, are not exposed to benthic organisms that usually mix and bioturbate ocean sediments. Thus sediment from disoxic environments preserve seasonal or annual differences in sediment type, which provides very high-resolution records within the sediments. Fossil plankton within the sediments, such as foraminifera, diatoms, coccolithophorids, etc., as well as their isotopic signatures reveal changes in water temperature and ocean climate. I also did considerable research trying to understand the environmental factors that affect the abundance and distribution of living foramininfera by taking plankton tows across the California Current. Another fossil found within ocean sediments are fish remains, scales, bones, and otoliths, of very abundant pelagic fishes like sardines and anchovies. By quantifying the changes in abundance of fish scales in different layers of ocean sediments, we can infer past changes in population sizes prior to the onset of industrial fishing. We also fish scale records with other paleo records, historical records of fish catch, guano harvest, or archived shipboard measurements of Sea surface temperature and/or wind speed to understand how pelagic fish populations respond to environmental changes over long timescales. With HPU graduate students and research collaborators, I continue to be actively involved in the above research and more, expanding into more work with cores of corals, turbidity in nearshore environments around Oahu and more. Projects of past and present graduate students are briefly described below. 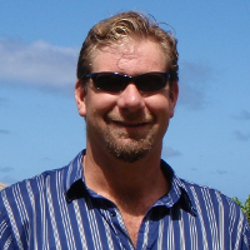 Thomas Remmington is analyzing records of fish catch through various Western Pacific islands and applying recently developed techniques to determine whether populations of various species of these diverse ecosystems are currently overexploited or are being fished at sustainable levels. The results of this work will be used by fisheries managers to make future management decisions. Rachel Tolliver is using cores of corals to reconstruct environmental conditions around Maunalua Bay, Oahu, an area that had extensive development and urbanization in the 1960s. She also developed a year-long time series of turbidity in the area and found that wave action, rather than rainfall, was a predominant factor affecting average turbidity. Her thesis results have implications for how historical changes in watersheds and the nearshore environment have affected nearshore ecosystems. Kevin Trick is examining the relationship between large scale and regional climate in the Pacific with variability in Hawaii rainfall. The research bears on issues of seasonal rainfall predictions in Hawaii. This research is also particularly relevant to understanding whether a long term decline in Hawaii precipitation may be related to global warming. Kimberly Rose quantified fish scales and bones in laminated sediments off of California to reconstruct changes in populations of small pelagic fish. Although there is a large amount of natural variability in these fish populations, a strong decline in these pelagic fish occurred throughout the 20th century, likely due, at least in part, to ocean warming. John Cavanaugh took sediment cores from Kawainui Marsh on the windward side of Oahu. Kawainui means big water in Hawaiian, and was given that name since the Marsh was a marine bay at the time of settlement. Sediment cores taken from the marsh were used to reconstruct the timing and transitions of Marine Bay to estuary to marsh. Not only did this research document important natural history of the region, but we learned how the development of a vegetation mat has changed water flow and sediment accumulation in this wetland region that filters out terrigenous debris from entering the ocean.